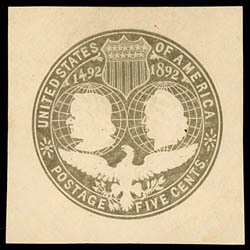 U.S. Rare Coin Co., Winona Minn., illustrated private post card showing 1615-16 1s Bermuda Coin and reverse with printed advertising message, bearing 1¢ dull blue (219) tied by fancy "Beef Slough" Minn. octagonal third-class cancel to the postmaster at Bird in Hand Pa., Very Fine and rare illustrated private post card. 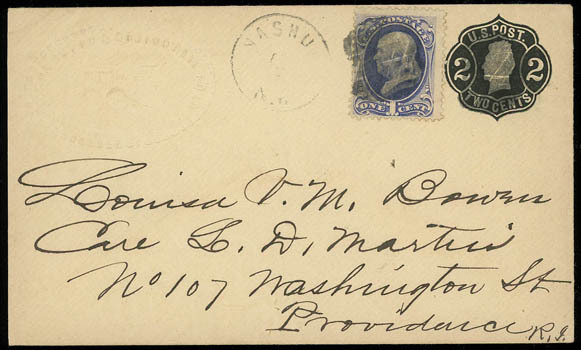 Envelope, 1864, 2¢ black on buff, die 3, type 13A, mint size 7 entire, Thorp Bartels 137m, Very Fine and rare, One of only Two Recorded Examples of this Entire..
Scott No. U50 var. Estimate $300 - 400. 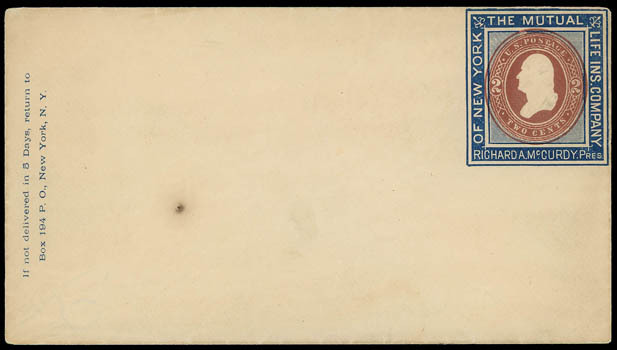 Envelope, 1864, 2¢ black on buff, die 4, upprated with 1¢ buff (112) tied by "New-York Jun 26" duplex to Johnsville Ohio; barely reduced at right, Very Fine and scarce franking. Scott No. U54 Estimate $300 - 400. 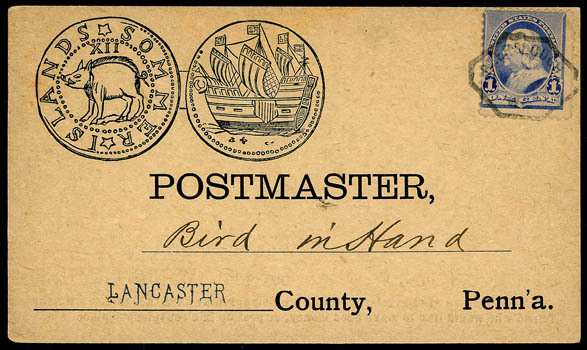 Envelope, 1864, 2¢ black on buff, die 4, uprated with 1¢ ultramarine (145), dark shape, tied by cork cancel duplexed with partial "Nashua N.H." cds to Providence R.I., blind embossed "Nashua Acton & Boston Rail Road" illustrated corner card showing Steam Locomotive; barely reduced at left, Very Fine and attractive. Scott No. U54 Estimate $150 - 200. (Ad Collar) The Mutual Life Ins. 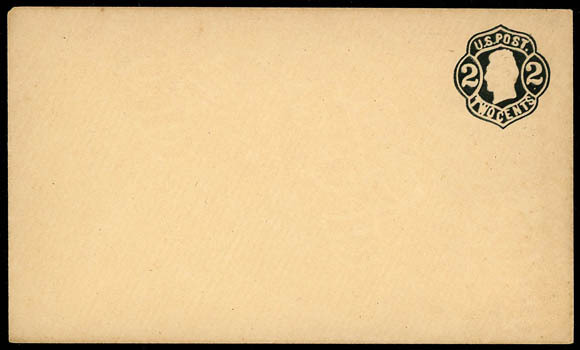 Company of New York, brown type 2 advertising collar on mint 2¢ red brown (U277) entire, size 8, matching return address printing at left, Very Fine and scarce. Scott No. U277. 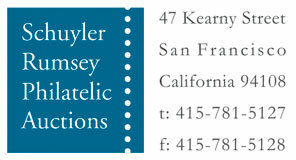 (Ad Collar) The Mutual Life Ins. 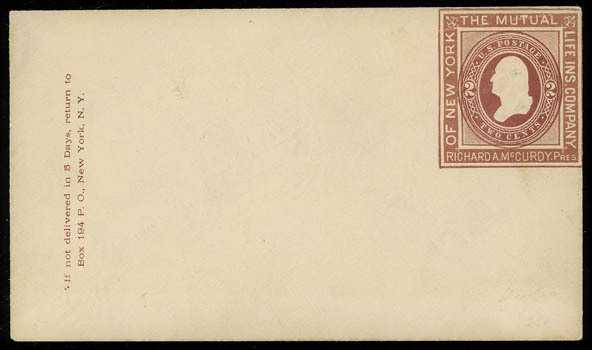 Company of New York, blue type 2 advertising collar on mint 2¢ red brown (U277) entire; small spot at left, otherwise Very Fine and scarce. Scott No. U277. 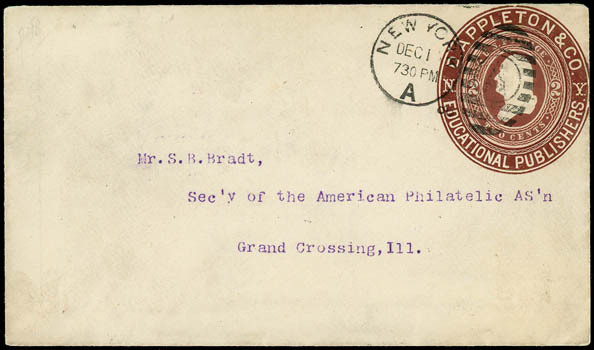 (Ad Collar) D. Appleton & Co., Educational Publishers, N.Y., brown advertising collar on 2c red brown (U277) entire cancelled by "New York, A, Dec 1" duplex to Grand Crossing Ill., Very Fine and rare used example. Scott No. U277. 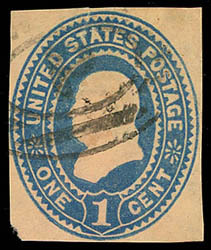 Envelope, 1887, 1¢ blue on oriental buff, cut square, clear margins, small tear and light creases, Fine, an extremely rare used example, unlisted in Scott in used condition; with 2009 P.F. certificate. Scott No. U298; $10,000 for unused Estimate $1,500 - 2,000. 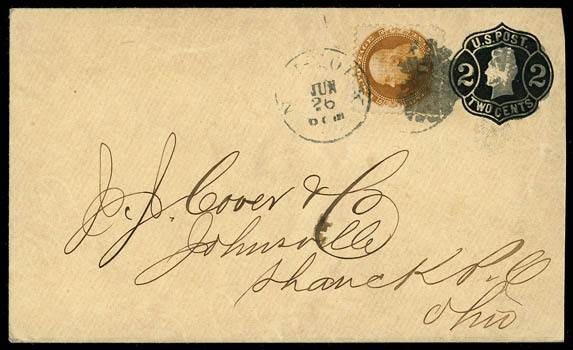 Envelope, 1893, 5¢ Columbian, slate brown color error, cut square, large even margins, strong true slate brown color, Extremely Fine, very scarce; with 2003 P.S.E. and 2013 P.F. certificates. 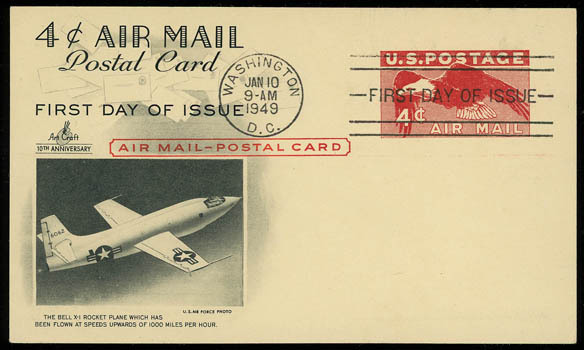 Airmail Postal Card, 1949, 4¢ deep red on buff, unaddressed & postmarked Washington, D.C. first day cancel with Artcraft cachet, Very Fine; with 1975 and 2015 P.F. certificates.